I must admit I was a tad afraid of picking up A Thousand Perfect Notes. Because I have bonded with authors after I’ve read and reviewed their books, but not before. So I was a little afraid of picking up A Thousand Perfect Notes to review because this is Cait’s book! The Cait I’ve known for years and who I watched write this book and talk about this book and get the deal for this book and reveal the cover of this book. But. But. I needn’t have been afraid because A Thousand Perfect Notes was so very, very good. Which didn’t come as a surprise, exactly, but it was a weight off my shoulders that I knew from the moment I started A Thousand Perfect Notes that it was going to be good. Heartbreaking and painful and dark and messy but also so good. 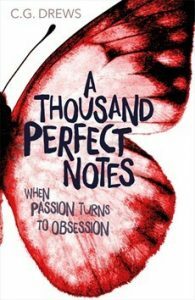 First things first: A Thousand Perfect Notes is not a lovely story. It’s not a contemporary read to snuggle down on the couch with. A Thousand Perfect Notes is one of the most brutally emotional, exceedingly dark, painfully heartbreaking books I’ve ever read. The story follows fifteen year old Beck, who is forced by his mother to play the piano far too often and way too much. Beck lives with his five year old sister, Joey, and both are emotionally and physically abused by their mother. I don’t think I’ve ever read a story that features child abuse in the way that A Thousand Perfect Notes does. I don’t think I’ve ever willingly picked up a story about child abuse before because it’s a topic that angers me and saddens me. Which it did in this story. I despised Beck’s mother; hated her. And I undoubtedly wanted to spirit both Beck and Joey away so I could give them the kind of life that they deserve – free from pain and turmoil and everything horrible. Even though A Thousand Perfect Notes is written in third person, there was no lack of insight into Beck’s thoughts and feelings throughout the story. In fact, I don’t think I’ve read such an immersive third person POV before. Sometimes it almost felt like first person because of the connection between the storytelling and Beck’s own actions, thoughts, and feelings. Even though my favourite POV to read is first person, A Thousand Perfect Notes made me rethink the way I see third person in terms of emotive writing. Major changes in Beck’s life come around because of August – a girl who is adamant and persistent in her desire to befriend Beck. At first, Beck has zero interest in becoming her friend, but over time August wears him down and he comes to care for her quite a lot. There is an element of eccentricity to August, which I think some may label the Manic Pixie Dream Girl, but to me August was more than that. Why is every eccentric girl now a MPDG? Are girls not allowed to be eccentric anymore? I liked August a lot, I liked her weirdness, her cuteness, her “out-there”-ness. And most of all I liked how she was the first person to really see Beck, to want to know him, to care about him. So to dismiss her as a MPDG is to do her a disservice, I think. The ending of A Thousand Perfect Notes was the most painful part of the book, but also the most hopeful. I won’t say anything more except that it was bittersweet and I don’t think this story could have or should have ended any other way. All in all, my fears going into A Thousand Perfect Notes were unwarranted. In this book I found darkness and light, humour and sorrow. And I know that Beck and Joey and August will stay with me for a long time. I’m just about to start this book so I somewhat skim read your review, but I saw some words that made me very intrigued to read it- heartbreaking, messy… I am looking forward to picking it up. Ah, I hope you enjoy it, Chrissi! It was definitely heartbreaking at times. Me too! I think I’ll always be afraid to pick up a book by a friend, even if I’ve read previous works or snippets and enjoyed them. I despised Beck’s mother to noooooo end. Yay, I’m so glad you loved this one. I’ve been reading really good reviews for it which makes me happy. One, it’s Cait’s book! But also, it just sounds amazing and like something I’d really love – I’m a big fan of contemporary books that deal with tough or dark topics. Those are some of my most favorites!!! Beck’s mom sounds awful. And August sounds lovely. And you’re right – girls can be eccentric and should not be automatically labeled a MPDG. That’s not fair. Me too! If you’re a fan of contemporaries that deal with dark topics then I think you will love this book, Lauren. I think Cait handled the issue really well, and with careful consideration, too. 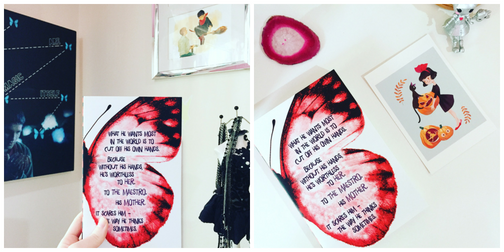 To be honest I’m a little inspired to write a post about girls + eccentricity + MPDG, haha. I really enjoyed it! I hope you like it as much as I did :D I think being afraid is normal when you’re reading the work of someone you know!